Ultrarunner, gifted writer, and new father Garett Graubins is letting me post his great write up about his experience at the 2007 Way Too Cool 50k. If you've read Trail Runner Magazine (or visited their spankin' new Web site) or Ultrarunning Magazine, you've probably enjoyed Garett's writing before. He was a former Senior Editor at TRM, and continues to contribute great stuff to both! My congrats to Lewis Taylor (good pic of him here from last years Oakridge trail festival), Beverly Anderson-Abbs , and the Sunsweet team for their respective wins, as well as everyone else who got out there and ran their hearts out. When Adam Ray, Jasper Halekas, and I sat down over beers last December, we mapped out our rough training and racing plans for 2007. Maybe the suds lowered our inhibitions, but our mantra soon became “scare yourself into achievement” and we wrote down our pie-in-the-sky, breakthrough goals for 2007. 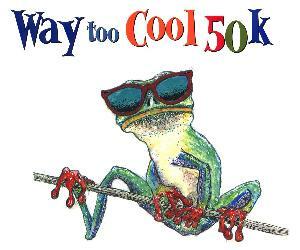 One of my goals was to crack the coveted four-hour mark at the March 10 Way Too Cool 50K. I knew this would be a tall order, as many of the sport’s prolific stars have failed to do so. Still, I felt confident through January and the first week of February that I was on target. After recovering from a late-2006 calf injury, my mileage had reached 55-60 mpw and weekly track workouts were reminding my legs that slow-and-steady is not always the top choice. I also trained knowing that I was going to become a daddy at some point in February. I aimed to cram in as many long runs and speed workouts as possible, since our child’s arrival (predicted by doctors to be Feb 13) would signal a new, quantum demand on my time. Our little boy arrived exactly as scheduled and I decided that I had effectively entered my taper period about four weeks before the Way Too Cool race day. This was sooner than I had hoped—about 10 more days of intense training with two more long runs would have been ideal. The weekend after Sawyer was born, I ran the PCT Sequoia Bayview 30K and placed third on a tough course that climbed roughly 3,000 vertical feet (Way Too Cool climbs 3,600 feet). My time was around 2:22 and I took this as reassurance that I might still be on track for a sub-4:00 on March 10. Apparently, the Sequoia race, along with major sleep deprivation as Sawyer learned the ropes at home, weakened my body’s immune system. About three days after Sequoia I came down with a shivering, coughing cold that sidelined me for a week. Even 18 days later, I had a lingering cough. As my cold dissipated, I managed some more training runs, but I did these with a “cramming” mentality akin to the night before a major college exam. Five straight days, I covered 6-8-7-9-6 miles with vertical. On the Tuesday before the Cool, I even put myself through a treadmill speed workout at The North Face gym, just to convince myself that I still had some lingering legspeed from January’s track sessions. I clocked a 17:59 5K. + Did not putz around at aid stations. Instead, I flew right through them as an aid station volunteer topped off my bottles with water. I estimate I spent a total of :45 total at all aid stations. + Did not pee the entire race … probably a sign that I was leaning toward being dehydrated. + Did not forget my shoes, like a certain fellow with whom I drove to the race. + Did not get lost or even turned around at any point. beforehand) in a very comfortable 37:30. This kept me on a four-hour pace. + Did not go gangbusters on the uphills. I took what they gave me and did a little power hiking which actually seemed effective in resting the legs. + Did not weigh myself down with any accoutrements. I knew the four-hour mark would be close, so I took a streamlined approach, hauling only the most essential weight. No iPod. No sunglasses. No hydration pack. I wore my 10.2-ounce Teva X-1s. I even opted to run with one of my two handheld water bottles empty for the first 6.1 miles, filling it only with my Perpetuem drink powder. On the race website, I found some splits. A guy that I didn’t know, named Vladimir Gusiatnikov, had run a 4:16 the year before and I thought this would be a good guideline for the run. I printed them out and taped them to my water bottle. If I wanted to get close to 4:00, I figured I would need to run each mile about :30 faster than “Vlad” as I called him while talking to his ghost on the trail. I fell into a groove early on and felt very comfortable, pushing the pace just enough that my heartrate was pumping but not redlining. I made it through the first station, Highway 49 (mile 6.1) about three minutes faster than Vlad. It was great to see a crowd of spectators here, and I topped off both of my bottles here, since the next station wasn’t for another 8.35 miles. I anticipated the heat taking a toll on runners, as temps in the mid 70s were forecasted. So, I took my first electrolyte table as I left Hwy 49. I took a tablet every 40-45 minutes throughout the race. The race’s first sizable descent, plunging to the Middle Fork of the American River gave me a sense of one of my current weaknesses as a trail runner—running downhill. In this section, Guillermo Medina pulled away while two guys stormed past me from behind. One of them was Rod Bien from Bend, Oregon. Rod and I ran together for the first 1/2 of last June’s Mt. Diablo 50K. I eventually pulled away on the race’s second climb. Today, nobody was passing Rod. He wound up finishing in 3:53ish, flashing some incredible leg turnover on the level spots of the course. After the descent, we ran a rolling doubletrack for a few miles just a few hundred feet above the American River. I kept Guillermo and two other runners insight. When we turned uphill for the major climb up to Brown’s Bar, I think I found some leg strength that had been dormant on the downhills, and I passed them while power hiking the steeps and running some of the not-so-steeps. As we reached the top of the climb, we hit a gorgeous rolling stretch leading up to the Auburn Lakes Trail Aid Station. Still, we were pleasantly in the shade. This was the case throughout the day, with very few sections that exposed us to the intense sunshine. It made for some nice miles. Also, there were mileage markers every 1/2 mile and I was able to get a rough idea of my pace by mentally noting my splits. Despite some hints of stiffness in my hip flexors, I was still running between a 7:10 and 7:30 pace on this stretch. At the Auburn Lakes Trail A.S., I was still outpacing Vlad about :30 per mile and on target for a 4:00 finish time. I topped off one bottle with water and, as I climbed a short stretch, took my second electrolyte table and an Aleve pain reliever. It’s not that I was in pain at this point; I just wanted to be proactive and address some soreness waiting for me later. Good call. The next section was a gorgeous 6.4-mile loop that ended back at the ALT A.S. I was beginning to feel tired around this point and focused on just maintaining my place. At one point, I passed some non-native bright yellow flowers and saw some stone steps leading uphill to an overlook. I assume this was the memorial to the woman who was attacked and killed by a mountain lion while running here years ago. For the next two miles, I did not see one pink ribbon and actually began to have concerns that I had accidentally run off course. Out of nowhere, I heard huffing behind me. It was not a mountain lion, but a guy who had found his second wind on this major downhill. He was swallowing up major yardage on every one of his long strides and I noted that he was wearing road running shoes. Many of the runners up here on the course wore road running shoes, including some Brooks racing flats that I’d only seen on track workouts and 5Ks. Near the bottom of the loop’s major downhill, another guy caught me. Yes, and then another. My spirits started to sag and I wondered if the next 12 miles would be a train wreck that would see me passed by countless people who had run more conservatively. One guy who passed me was Jeff Riley. He found a nice stride on a level one-mile stretch and I paced off it to the bottom of the race’s steepest climb, Ball Bearing hill. One thing I do well is climb. Maybe it’s my Colorado roots or my genetically big thighs and calves. I dunno. But on this climb, I made great progress in catching and passing three people who had passed me a short time earlier. By the top of the climb, a return to the ALT A.S., I was feeling better about myself—a false sense of hope exacerbated by the fact that I had outpaced Vlad my three whole minutes on that loop. I was on target for the 4:00 mark … but just barely. The next leg of the race—a rolling 5.4-mile leg to Goat Hill Aid station—proved my undoing. I knew as I left ALT A.S. and took a Gu (my third), another electrolyte tablet, and a Tums that this would make or break my run at 4:00. It lifted my spirits to see other runners (still heading out on the course) and some mild downhills on this shady, pine needle-cushioned singletrack were downright heavenly. On one switchback out of a stream drainage I was surprised to catch a pursuing runner out of the corner of my eye. He passed within a quarter mile and began to pull away. He was lean, smooth striding, and wearing road shoes. I paced off him to the beginning of the next climb, an uphill burn called Goat Hill. I smiled and kept my legs churning uphill. At the same time, I felt bad for this guy, because he’s obviously a gifted runner and didn’t deserve to be back in my neighborhood. I encouraged him to keep moving along because we were very close to the 4:00 cut off. At the top of Goat Hill, with the A.S. in sight, I took my final gel as I caught two more guys. It looked like the climbs had taken a toll on them, too. I jogged into the A.S. where a guy wearing a dress and wig filled my bottle with some cold water. “I’m not your mom,” she/he said gruffly, “I’m your date later.” Later, at the finish line, I spotted several runners with huge, lip-shaped smudges of crimson on their cheeks and foreheads. One of them, naturally, was the indomitable Gordy Ainsleigh. Looking at my watch, I had roughly 35 minutes to cover the last 4.6 miles. I rationalized that I could still crack 4:00. For some reason, I had in my head that the final miles would be a cruiser, with beautiful, run-able single track and maybe a big downhill. “Eight minute miles,” I thought, “No problem.” I was wrong. It was tough to make good time over the next 2.9 miles, as there were a few decent uphills and the downs had some rocky singletrack that I had to pick my way down instead of striding out. Not that I had the legs remaining to really hammer—I was feeling beat up and was running mainly on emotion at that point, pulling a whole mess of motivational tricks to push myself to crack 4:00. The whole time, I kept an ear open for the sounds of Highway 49 and the race’s final aid station. 2006 time by 17 minutes to crack 4:00. I noted that Vlad ran the race’s last 1.7 miles in 12 minutes. That meant I had to make highway 49 by 3:48, 3:49 at the very latest. “Surely the homestretch will be easy running,” said the optimist on my shoulder. But, as my watch ticked past 3:50, my heart sank. I was braced to dig deep for sub-4:00, but 1.7 miles in sub-10:00, on trails, is ridiculous after 29 miles. I came through Highway 49 at 3:51 and ran right through, on the off chance that I could pull a rabbit out of my pocket. There were many people there, and I had an adrenaline rush as they hollered encouragement. Maybe I could do it. Maybe the remainder of the course was really closer to 1.4, Not. Any hope dissolved like a salt tablet when I hit a steep, rocky uphill shortly after leaving the A.S. I let out a little howl, knowing that I wouldn’t crack 4:00. At the top of the hill, I caught a view of the Cool Fire Station just beyond a large, fenced-in meadow. That was the finish line and I kicked it in around the field’s perimeter, clocking a finish time of 4:02:32. So, I missed my pie-in-the-sky goal of cracking 4:00. But I’m not necessarily disappointed. I ran the best race that I could, given the ups and downs of the last month, becoming a daddy (the greatest) and shivering through a few feverish nights (obviously, a down). I concluded that 4:00 at Way Too Cool is right at the edge of my ability as a runner, so it will be a great goal for me to renew in the future. With a little bit of course knowledge, the right conditions, a few more 20ish training runs, another month’s worth of speed training, and some downhill practice, I’m confident that I could do it. Great report and great run! 4:02 is a very fast trail 50k. Congrats to you on the run and on the new little one. Hope to see you somewhere when I return to the states. Scott thanks for the guest blog! I agree. 4:02 is a very respectable time for that course. Maybe next year you can crack it, but I would be pretty damn proud of a 4:02. Man, I am always amazed at how much you guys can remember about your runs. Did I do too much damage in college :0??? I remember starting, struggling along, and finishing. Scott, thanks for making this the best running blog on the web. Garrett, good seeing you my man. Looking forward to tracking you at Wasatch. great article and a very nice time. My 2003 effort was in much cooler temperatures, high of 55 °F vs. 69 °F in 2007. As much as I'd love to improve on that 2003 result, I don't think it is possible to count on being able to enter this race. So, my own quest for a sub-4-hour trail 50 leads elsewhere. I have read many of Garett's articles over the years. He is a gracious and talented writer, and I'm glad to hear he is continuing to contribute. It sounds like he is no longer at Trail Runner Mag? Where is he these days? Working on the great American running novel? Love the site, Scott. When I get an update on MyYahoo, all things stop until I read your latest entry five times. Of course I wish you would post more often, but then again, would I read so eagerly? You are WAAAY better than Runners World. You could so charge for subscribing to this site. I will let Garett update you on his whereabouts when he gets a free moment. Thanks for your kind comments about the blog. I enjoy writing it, but 1-2 updates per week is about as much as I can do (it does come second to going for a run, after all). No subscriptions though - I think it's best if it's free for all to peruse. If you keep reading, I'll keep writing, that's the deal. If you have a blog of your own, be sure to point me to it so I can see what you're up to! seriously great blog...i love reading it. that sounds like a really fun, exhausting race! we're finally thawing up here in MN and getting ready to get muddy. Great race report, thanks! It's good to hear what's happening at the front of the pack too. One of these days soon I will post my own report, but for now I'll just say it was an incredible day! Congrats on a superb time! As an Ultra-Marathoner myself [Chicago Lakefront 50K, 2006, 6:20, 9th in division] I appreciate the effort a 4 hour time entails. It's them legs. I remember Garett when he was a pup - always kickin' up a storm. PS: Riga 50K in June. I'm in the Death Ride this year!